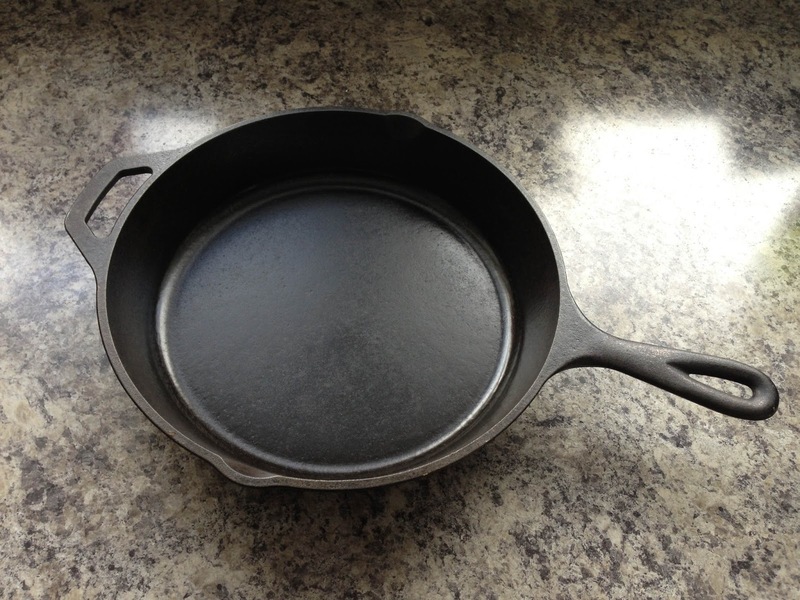 Cast iron fry pan – Hubby has spent a lot of time getting this thing to a point where it is totally non-stick. We cook everything in this baby! From morning eggs, to a stir fry and even steaks. We use it so much that it actually lives on the stove next to the kettle. I use to put it away but have just giving up totally since we use it on most days twice. 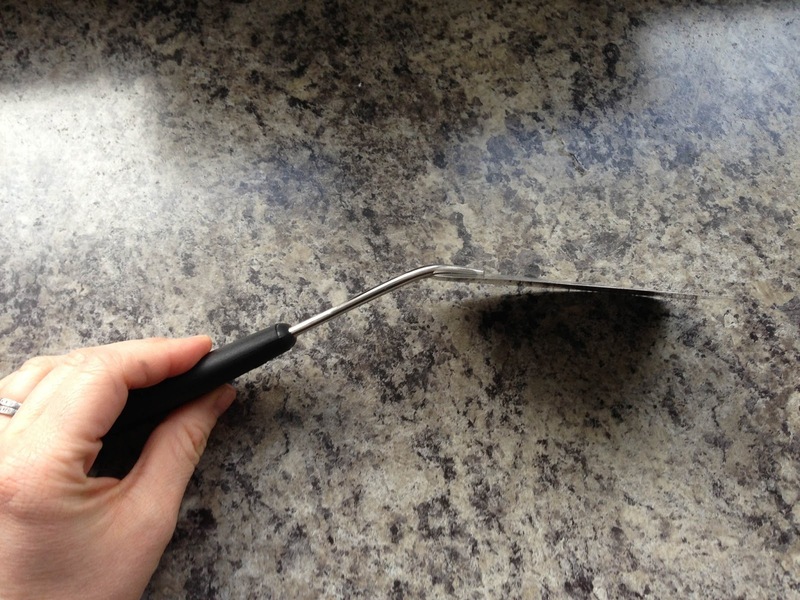 Super thin metal spatula – This is the greatest tool ever! Hands down. Not only it is awesome for cooking with but for cleaning too (everything but Teflon coated stuff which we only have one thing with Teflon on it). You know when you bake chicken and all the bits are burn/stuck to the bottom of the pan. Well this sucker gets everything off, no soaking. Hubby’s the dish man and ever since we got this spatula a few years ago he stopped giving me a hard time about really hard to clean pans!! Everyone wins! Blender – I’m going to write a whole post on this because we make smoothies everyday. We have gone through 4 blenders, no joke. When we got married Hubby’s cousins got us a heavy duty one and it’s been going strong for two years now (the longest we’ve had a blender). More about the blender and smoothies to come later on. 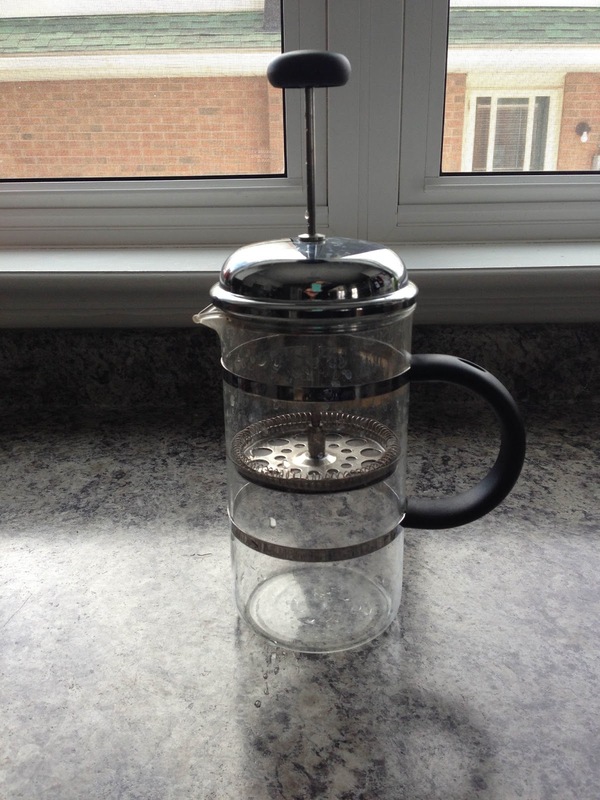 French press coffee maker – I know, sounds fancy. Since we moved back home we have not been able to fine the lid of our coffee pot, making it impossible to use the maker all together. Hubby thought it would be a good idea to use our espresso maker instead. He actually pushed for it because an americano is way better then drip coffee anyway. He was happy to make it for me in the morning (what a guy!). Then we were at my cousins one weekend and she made coffee with a french press. Our lives have never been the same since. It takes up hardly any space on the counter and the coffee is amazing! I’m not joking probably the best coffee. We grid up a bunch of beans and have them in the cupboard ready to go. Then in the mornings when I’m making my lunch I put the water on and it’s boiling by the time I’m done. It really is very easy and worth it! 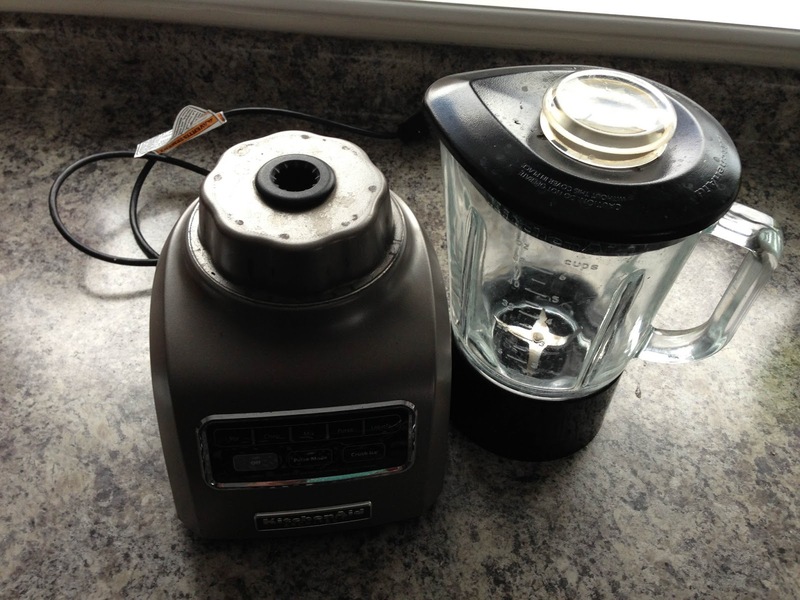 Since we don’t have a big old coffee maker out on the counter it leaves room for our beloved blender!! 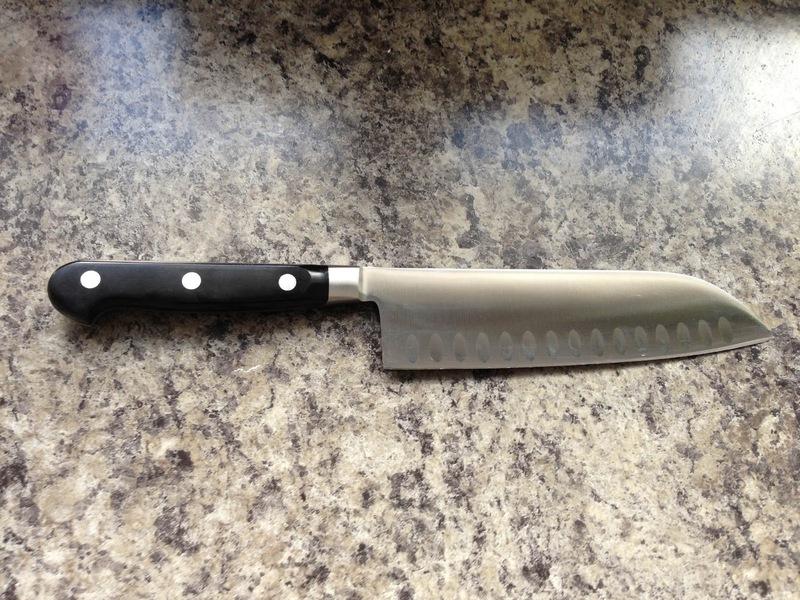 Chef Knife – Enough said. Every kitchen should have one of these. Ours was a gift from my aunt and I truly love it. I would have never thought I would love a weapon so much but I do. If I could only have one thing from my kitchen it would be this baby. Ummm, actually that’s kind of a lie. I would totally take the cast iron pan. Sorry knife but you have been demoted to number two…actually five because you are fifth in this list. Still pretty important regardless. 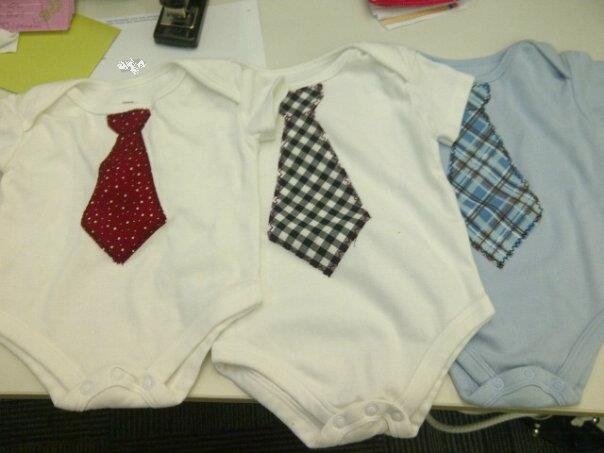 As promised, the onesies tie post! I’ve gone to a few craft shows and I can’t help but notice all of the little girl stuff. Don’t get me wrong, I love me a tutu, but boys are getting the short end of the stick! This had me thinking, what can I do! Then, shortly after I was watching Tori & Dean (I have a junk TV show problem) and her little guy was wearing a t-shirt with a tie on it. It reminded me of a tux t-shirt, which are awesome in there own right, and I really liked the idea. So I thought it wouldn’t be that hard so I gave it a try! I’ve been making these for a little over a year and have even done some orders! 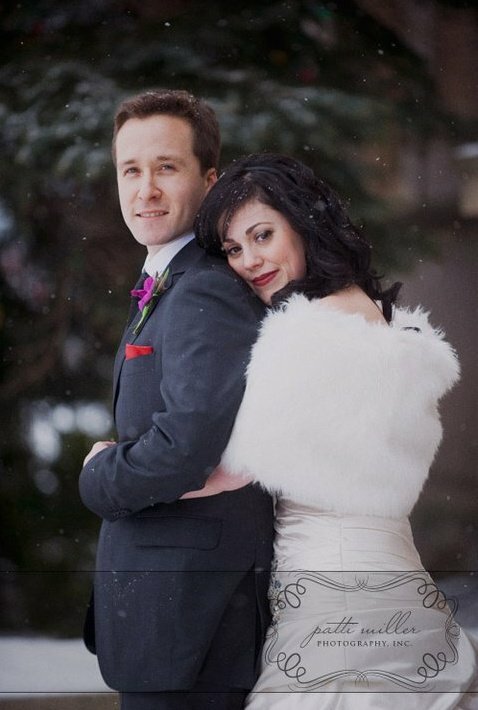 My favourite part about making them so far: three of them made it to Christmas cards of friends and family this year! I have a few other ideas for little boys and I’m hoping to get to a craft show myself, one day. My goal would be to rock it with all my awesome little man stuff. Tutus, be warned!! This past August I came across this little cutie on pinterest. I couldn’t get over how cute she was and thought “hey, why can’t I make a hat like that hat?” Well the answer was pretty easy, I didn’t know how to crochet. I had a week of holidays coming up and decided that I would teach myself how to during the holidays. We have four nieces and I wanted to try and make them these hats for christmas! So I started out with making Hubby a basic hat. After starting, pulling it apart and starting over, I finally got it! I did a few more hats and got the hang of it. We went on a few road trips and I crochet the whole time while in the car! I was really getting into it and even started doing it on shorter one hour car rides. 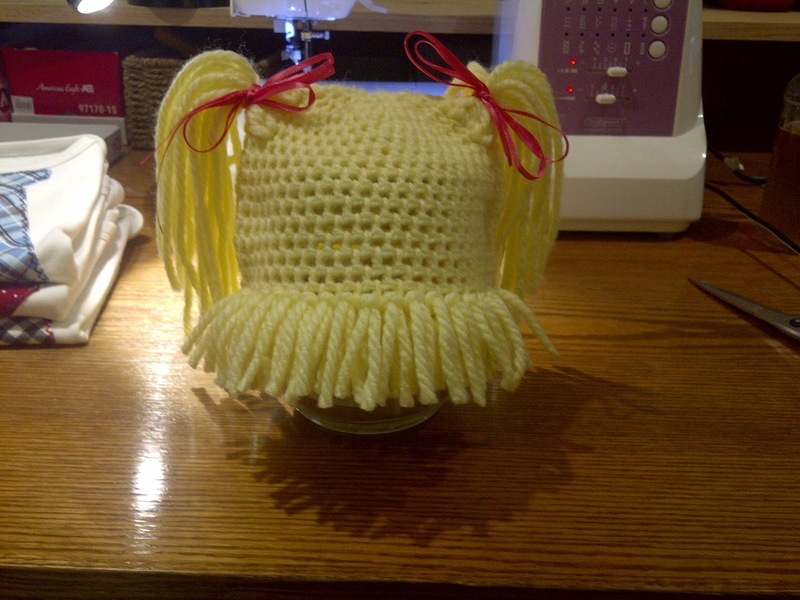 Then by November, I gave the dolly hat a try and I did it!! I have a great friend at work that let me use her girls for the prototype and we were able to prefect it. Please note a post will be made about the onies ties in the background later this week!! So in the last 3 years, I have taught myself to sew and crochet. Let’s just say I’m a little proud of those accompaniments. I just need to send out a big thank you to the thing that helped me most of all, YouTube!! I normally use a H 5.00 hook and matching yarn. For the hair I use a thicker yarn because its more full looking. once on the hat) in each stitch. Lay the hat flat and in the round 3 loop the two pieces of yarn. Then repeat this until you are happy with the ponytails. I prefer nine altogether (three rows of three). 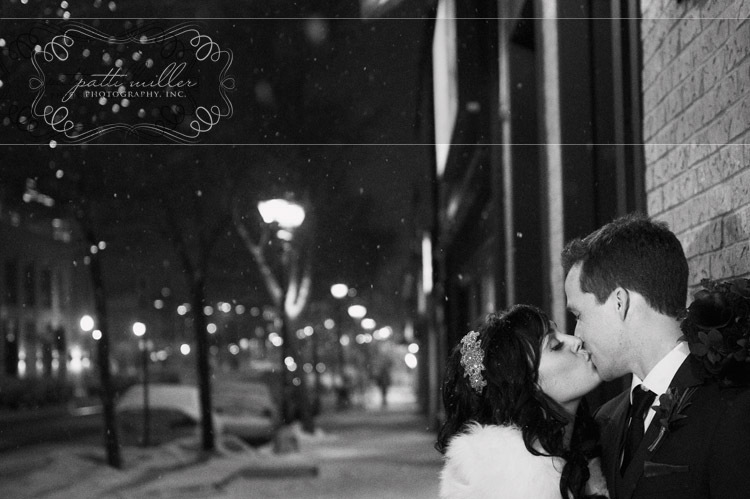 Knot off with a bow! Bangs: The process is pretty much the same as the ponytails but use just one piece about 6 inches long in two rows (and cut after). I do the first row in the third one from the bottom and the second row over top of that. Trim off the “hair” and you have your dolly hat!